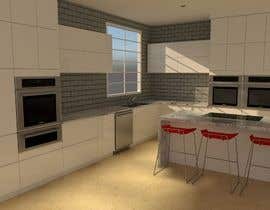 The task requires an interior design proposal by freelancer and CAD visualization of a living / kitchen room area, followed by up to 5-6 revisions during the award period (in order to see how different furniture elements etc work together, depending on design submitted by freelancer). The freelancer has to work creatively and create a good design where details and elements work well together, while keeping in mind the restrictions and existing furniture. 4. Freelancer to design a sofa. Must contain storage for bedding, allow comfortable sleeping for 2 persons. Must have armrests on both sides. Maximum total length from side to side 222cm. Maximum width including any extensions to not exceed 120cm when seated (larger when opened for sleeping, >140cm). I will provide catalogue of c. 300 textile color options to choose from. As a start can also propose affordable sofa matching these requirements from available products / shops. 7. 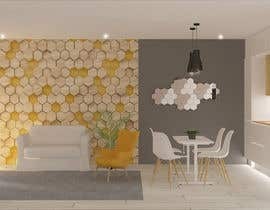 Freelancer to propose additional decorative accessories (hanging clock, pillows etc) and any additional recommendations. 8. Freelancer to propose picture for placement as kitchen splashback to be printed and covered with hardened glass. Must submit high definition picture which can be printed in large size. This could potentially be a cut-out from the 3D wallpaper, also under consideration is INOX mirror. Looking for creative solutions here. 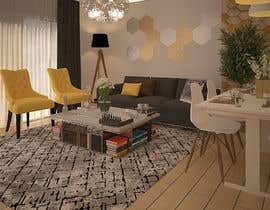 Please provide your first proposal during 24h period which includes existing furniture and your creative recommendations for new furniture (the lamps, the couch and colors, the floor, the kitchen backsplash print, the new arrangement of BESTA modular wardrobe, the placement of the wallpaper). Deadline for full project completion including sofa design (including render exchanges until we arrive at final project) up to one week. Hi everyone. I could extend the deadline by 3 days, however then for the submission I will require minimum two renders each and also all the product codes & links for every item you propose. The alternative is that you submit initial creative proposals now but provide all the details and fine-tuning during the award handover period. Let me know what you think? Can you extend the project date by a day or two? I have an almost complete model, but will need a bit more time. Also, do you need a fully textured and colored model, or can i just submit a rough gray scale model? Thanks for all the help. Hi Bob, I know that the deadline is quite tight and I understand if during the 24h period freelancers submit concept proposals which are not yet in the form of final render including all details and product codes. For now I would like to see your creative ideas - what kind of furniture you are proposing, floor color / color scheme, how you envisage to re-model the modular wardrobe elements. You can also attach previous portfolio examples to your submission. Once I pick a winner I expect to go through a few re-iterations of the renders and product selections during the handover process (which has a maximum period of 2 weeks). For the final submission (during handover) I require fully fledged color photo-realistic render (CAD preferred) and a list of all product codes and links. If right now you want to submit in black&white but are able to produce colorful model during the handover period please inform me. I increased the price - hope to receive nice proposals.